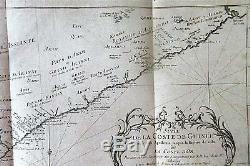 1747 WEST AFRICA MAP (Gold Coast) shows slave trading tribal areas and identifies tribes/kingdoms. Map shows the names and locations of the tribes that occupied the Gold Coast in early 18th century. Antique French folding map, attrib Bellin (French), date 1747 penciled in margin in hand of prior owner. SUITE DE LA COSTE DE GUINEE despuis le Cap Apollonia jusqu'a la Riviere de Volta ou LA COSTE D'OR dresse sur les journaux des navigateurs par NB Ing. 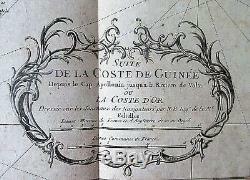 Roughly translated Map of the Coast of Guinee from Cape Apollonia to the River Volta, taken from the notes of navigators by N. Ing Antique engraved French folding map measures measures approx 18" wide by 10" inches tall, full plate mark, image area slightly smaller, matches the description for Bellin (although not so identified) Two folds, blank on back. 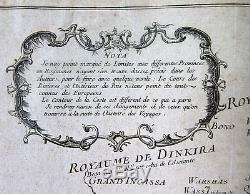 Tribal/kingdom names include Roy de l'Assiante (Asante, Ashante), Dinkira, Agonna, Monpa/Manpa, Ladinkur and many more. Depth soundings indicated along the coast line. Sheet slightly discolored with age, some old tape in the margins on the back. Original antique map, not a reproduction. This is a final sale. Google: Gold Coast Slave Trade 18th century for links that give the history of this area. Would go well with a West African art collection or collection on the African slave trade. 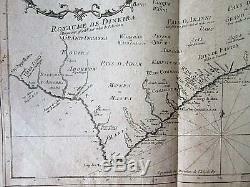 We have other antique maps of Africa, - see our other listings. Also maps India, Asia and the Pacific. We have other items of Afro American Black interest. We have been antiquarian book and print dealers since 1979. Please view our other items. Visit us on Maui by appointment. The item "C1747 Antique MAP Chart W AFRICA SLAVE areas TRIBES kingdoms Gold Coast Bellin" is in sale since Wednesday, February 27, 2019. This item is in the category "Collectibles\Cultures & Ethnicities\Black Americana\Other Black Americana". The seller is "ppacific" and is located in Wailuku, Hawaii. This item can be shipped to United States, Canada, United Kingdom, Denmark, Romania, Slovakia, Bulgaria, Czech republic, Finland, Hungary, Latvia, Lithuania, Malta, Estonia, Australia, Greece, Portugal, Cyprus, Slovenia, Japan, China, Sweden, South Korea, Indonesia, Taiwan, South africa, Thailand, Belgium, France, Hong Kong, Ireland, Netherlands, Poland, Spain, Italy, Germany, Austria, Bahamas, Israel, Mexico, New Zealand, Philippines, Singapore, Norway, Saudi arabia, Ukraine, United arab emirates, Qatar, Kuwait, Bahrain, Croatia, Malaysia, Brazil, Chile, Colombia, Costa rica, Dominican republic, Panama, Trinidad and tobago, Guatemala, El salvador, Honduras, Jamaica, Viet nam, Uruguay.